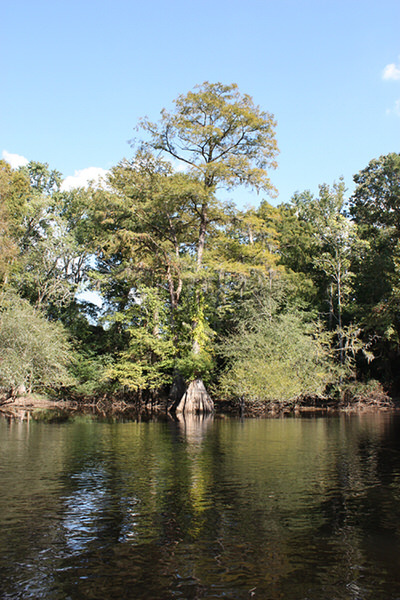 The SC Revolutionary Rivers Trail follows the scenic Lynches River from Lynches River County Park to the cypress and tupelo laden stomping grounds of Revolutionary War hero General Francis Marion. The fact that Marion and his band of militia could simply disappear into the cypress swamplands earned him the name of the Swamp Fox. The sixty mile trail offers a series of short excursions and overnight rustic camping opportunities. 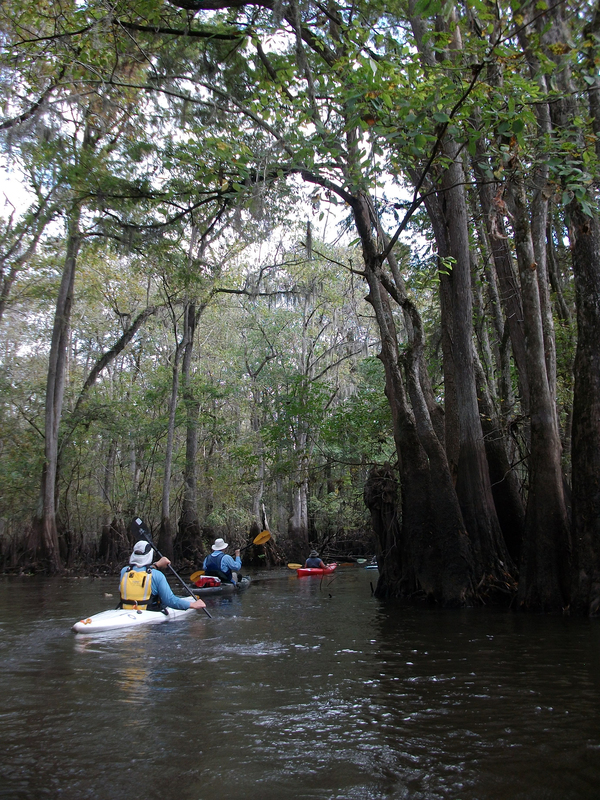 The SC Revolutionary Rivers Trail highlights a scenic waterway and the cypress and tupelo swamplands used as a hideout by Revolutionary War hero General Francis Marion by which he gained the nickname Swamp Fox. British office Colonel Tarleton declared after Francis Marion eluded him, "as to this damned old fox, the devil himself could not catch him." By use of his guerrilla warfare techniques, Francis Marion played a key role in the colonies' winning the Revolutionary War, making Francis Marion the one of the most popular National Heroes following the Revolutionary War, second only to George Washington. Key Francis Marion sites along the SC Revolutionary Rivers Trail include Venters Landing (Witherspoon's Ferry) where he took command of the Williamsburgh Militia, Dunham's Bluff where Marion built an earthen fortress, and Snow's Island where he and his men hid from the Loyalists. 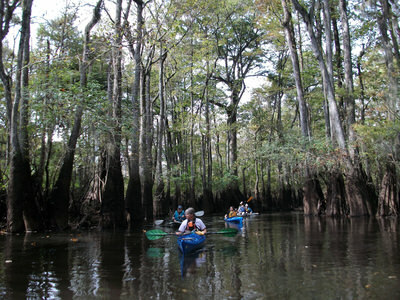 The SC Revolutionary Rivers Trail offers paddlers an unique experience of floating through cypress and tupelo laden swampland that was once traversed by Patriots engaged in guerrilla warfare against the Loyalists. General Francis Marion's militia, mounted on sure-footed Marsh Tacky horses were able to navigate through the region, leaving the Loyalists far behind. The Revolutionary River Trail links up with the Stagecoach Hiking Trail at Lynches River County Park. This trail follows the road that was the most significant means of travel in the 1700s and 1800s and ran from Winston-Salem, NC to Charleston, SC. 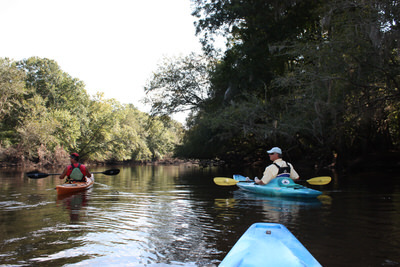 As with most paddling trails, the SC Revolutionary Rivers Trail offers low impact aerobic and cardiovascular exercise to build upper body strength. Paddling is also a popular activity for diverse demographics, allowing opportunities for vacationers and urban dwellers to experience nature. The waterways constituting the SC Revolutionary Rivers were used as a hideout for General Francis Marion during the Revolutionary War. Before and after that time period, the rivers were used as the primary trade routes until railroads were laid. Sixty miles of this trail follows Lynches River which was designated as a State Scenic River in 2008. The upper section of the river was so designated in 1994, and the stretch is approximately 111 miles. In 2008, Tourism Development International was hired to develop a plan for Florence County which included a spotlight on eco-tourism, primarily at Lynches River Park and in Johnsonville. The Ireland-based group recommended a focus on the Swamp Fox, internationally recognized for his guerrilla war tactics, as the unique selling product for the county. 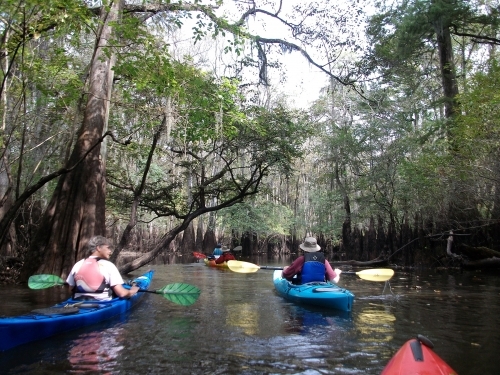 Emphasis was placed on nature-based and military history education through interpretive sites and the unparalleled pristine river systems in lower Florence County.In 2009, Tourism Development International was hired by the State of South Carolina to develop product development plans for the various regions across the state. Once again, Tourism Development International noted that the overall center of attention for the eight-county region was to be General Francis Marion, the Swamp Fox. In 2012, the Francis Marion Trail Commission erected sixteen interpretive panels at key Francis Marion historic sites, including three which are included in the SC Revolutionary Rivers Program: Venters Landing where Francis Marion took command of the Williamsburgh militia, Snow's Island where the militia camped, and Dunham's Bluff where he built earthen fortifications to protect his trade routes. In 2013, the South Carolina National Heritage Corridor with the financial assistance of Duke Energy recommended the SC Revolutionary Rivers program as a component of the SC Great Outdoors program. Lower Florence County was one of two pilot communities to benefit from this professional product development assistance. There are several special events which take place at Lynches River County Park and Venters Landing, two locations along the SC Revolutionary Rivers Trail. At Venters Landing a statue of Francis Marion has been erected, and the annual Johnsonville Heritage Festival is held. In addition to the music and environmental education-based events which occur on a monthly basis at Lynches River County Park, the River Jamboree is held on an annual basis. Building awareness of the park facilities while offering educational sessions, reenactments, live animal shows, canoe excursions, and hay rides, the park draws thousands of visitors to the Jamboree. The Environmental Discovery Center is open on a daily basis to educate the public about nature through high-tech methods. Strategically placed weather stations show live fluctuations in temperature and humidity between the forest canopy and an urban (parking lot) environment. Recordings of infrared cameras show nocturnal animals at feeding stations. More than twenty geocaches have been placed throughout the park to entice visitors to discover less-trekked places. The management of the SC Revolutionary Rivers Trail is very cost-effective and sustainable. Administration is housed in an already established quasi-governmental entity, Florence Convention and Visitors Bureau (CVB). The SC Revolutionary Rivers Trail committee has been formed by a partnership of the CVB, Florence County, Town of Johnsonville, Department of Natural Resources, SC Forestry Commission, Pee Dee Land Trust, Eastern SC Heritage Region, SC National Heritage Corridor, local outfitters, and landowners. Though informal, the relationship between the river guides and neighboring landowners is strong and the regional land trust is actively working in this area to protect bottomland hardwood forests along the river. The SC Revolutionary Rivers Trail Committee brings together a strong combination of private, governmental, and public representatives who coordinate their efforts and communicate about safety and maintenance matters. Maintenance could best be described as attentive but minimal management – just clearing the river trails enough to allow passage of small boats such as canoes or kayaks and gathering and disposing of any trash that is found. Guides run stretches of this river frequently throughout the year and monitor for upkeep and safety. The surrounding land is mostly protected by the state’s Best Management Practices for forestry except several miles of bottomland hardwood forest that are held to a higher standard – preserved with conservation easement through a local land trust. There are plans for improved signage along the waterway to be implemented by April 2014. In order to keep from interrupting the pristine environment, mile markers and directional signage will be placed unobtrusively on wood duck nesting boxes along the river trail. Members of the SC Revolutionary Rivers committee will ensure that the nesting boxes are maintained properly between nesting seasons. Interpretive panels providing education about nature / ecology, edible botanicals, geography, and military history will be available for placement at key historical locations, pending approval of landowners. These 36"x48" panels will be fiberglass interpretive panels set in powder-coated metal frames, following National Parks standards. When the River was designated a Scenic River in 2008, a paddling guide was created with a series of maps marking landings and other features along the way. This guide is available free to the public in hardcopy and online from the state Department of Natural Resources. It includes substantive information about paddling etiquette, safety practices, and ecological and recreational features. Recently paddled this newly cleared section and was thrilled at this new paddling opportunity. Very scenic section with very little development. I counted 4 houses in 12 miles. Looking forward to bring my paddling club here to do it again. Thank you for all the hard work. Have done many sections of the Lynches and they all have a different feel and ecosystems. Recently did Half Moon to Center's. Loved how the river changed and lack of development. Looking forward to doing it again. Paddling these revolutionary rivers you really do feel like you are stepping back in time.